While educating his younger brother, Speed, about the pseudo-spiritual relationship between car and driver, Rex Racer (Scott Porter) drops the line, “The car is a living, breathing thing.” This blended approach to mechanization and organic existence presents a useful ideological foundation for untangling the aesthetics and politics of Speed Racer, the Wachowski Brothers’ most recent exploration of their favorite topic: the dynamic between man and machine. 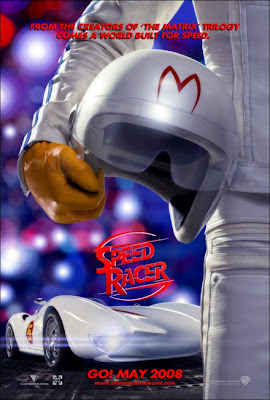 A stylistically bold film, Speed Racer displays a world in which even emotions are computerized (in the romantic scenes, watch the lights morph into little hearts), in which all people are digitally-enhanced, but in which the mechanized individual must still struggle against the even more constricting clockwork of corporatism. In a globalized landscape of shiny plastic, Speed (Emile Hirsch) battles for the rights of the rugged all-American individual, decked out in 1950s retro-futurism and carrying a chip on his shoulder for the lost family-oriented, grassroots ideal. More than just a racer, Speed is a Bull Moose capitalist. Admittedly, Speed Racer’s plot does contain some divots, but these sometimes not-so-minor flub ups are essentially insignificant. 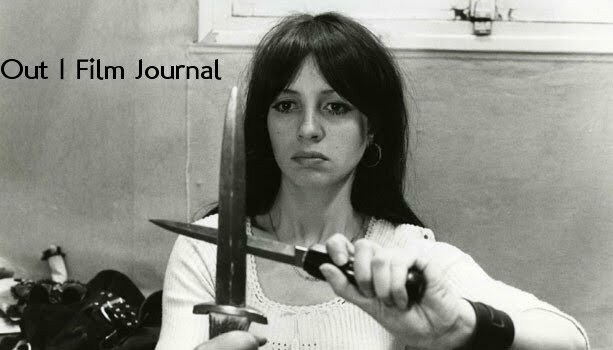 Concentrating on technical flaws in a film about generalized mythologies and broad thematic strokes is a fruitless endeavor. Speed, a terrible student and excellent daydreamer, learns to race from his brother. His dad, Pops (John Goodman), owns an independent racing company. Speed’s mother, Mom (Susan Sarandon) is caring and perfect, and blah, blah blah. For those who didn’t catch that, his parents don’t even have real names. Can it get more archetypal? His brother dies, possibly trying to take down the pesky racing-industrial complex. Speed fills his shoes, becoming a prodigy. Courted by Royalton (Roger Allam), a corporate mega-badass, to race for his company, Speed must make the decision to grow cynical and give into the system, or fight for family, pride, and fair-dealing individualism. Guess which one he chooses. Keeping with its origins as a Japanese anime program (called Mach GoGoGo and later adapted for US audiences), Speed Racer exudes a distinctly presentational style that combines elements of numerous genres (slapstick, action, martial arts, political-ish thriller, animation) and eschews any pretensions to emotional or narrative “realism.” Speed’s brother, Spritle (Paulie Litt) and his chimp, the aptly named Chim Chim, provide ridiculous comic relief throughout the film (as if it needed it) and Christina Ricci adds to the film’s superficial ethos as Speed’s foxy and spunky love interest, Trixie, diversifying (or derailing, as some might say) the film’s tone. One of the most befuddling criticisms that I’ve consistently found regarding the film typically attacks it for basically being a light, sparkly mess. However, I don’t think Speed Racer ever truly aspires to be more than a big blob of bubblegum, nor do I think it ever could be, without eliminating its very essence. Everyone seems to be forgetting just how delicious bubblegum is, especially when you’re not expecting steak. Speed Racer is certainly an exercise in whiz-bangery, but it’s an exercise I haven’t seen before and it’s an exercise that actually creates a world in which such an approach is valid. Essential to the world of Speed Racer is its brave interpretation of cinematic space and time. Consistently throughout the film, the digitally-enhanced editing of Roger Barton and Zach Staenberg violates preconceptions about staging, camera motion, and narrative structure. Repeatedly, flying head zoom through the frame, overlapping with others, unattached, freely navigating the physics of the screen. This creates a unique aesthetic that ratchets Bergman’s spacing in Persona (1966) to even more surreal heights, particularly during a scene in which Royalton connives with Mr. Musha (Hiroyuki Sanada) to screw over Speed and Racer X (Matthew Fox), a mysterious masked figure who works for the CIB (Corporate Investigation Bureau?). This same kinetic use of heads and dismembered parts defines the racing sequences, in which the faces of announcers punctuate the scenes with a strange visual uniqueness, opening up unexplored spatial dimensions. Additionally, the film breaks the sacred 180º rule multiple numerous times with its rapid 360º editing, including the dialogue between Speed and Royalton in which Royalton explains the corporate hand that guides the results of the Grand Prix: the biggest race of them all. Incessant zooms and whip-pans further complicate the spatial design of Speed Racer, depicting space as malleable and shortened, tapping into the flashy bombast of the film’s outlandish source material and recreating the visual compaction of comic book frames. Temporally, persistent flashbacks and flash-forwards confuse and stretch the simplistic plot into an arc that, while not always effective, is surely experimental by Hollywood blockbuster standards. Stylistically, the Wachowskis deserve an A for effort. All of the film’s experimentation is made possible by its extensive use of CGI, which, when mixed with live-action elements, forms an aesthetic scheme that echoes the film’s admittedly half-baked thematic concerns. Where does life end and technology begin? Should people strive for mechanized accuracy? Is there room for the strong individual in the calculated determinism of systematized, mechanized corporate control? The film answers these questions with a romantic idealization of triumphant conservatism that seems to take a page out of the books of Ayn Rand or the political philosophies of Teddy Roosevelt. Contrary to the claims of “Neo-Leftism” hurled at the film by some critics, Speed Racer proposes a value system that, while being anti-corporate, speaks nothing of collectivism or equality. Speed is the amazing savior of the film, a powerful, exceptional individual fighting for his family, his pride, and his livelihood. He harps on the importance of fairness (the film’s final frame features the phrase “cheaters never prosper”), but it shouldn’t be forgotten that Speed is an unashamed competitor. He is the capitalist ideal of up-front competition, stating at one point, “You’ve gotta win if you want to keep driving.” These political values, however, are far from unusual by Hollywood standards, where morally-sound capitalists abound in surprising numbers. Speed’s views are almost a return to the default archetype of heroism, which is somewhat refreshing at this point. Miraculously changing the game with his ethos of hard work, individualism, and family, Speed’s actions prompt the phrase, “It’s a whole new world,” from a populace inspired by his zeitgeist-influenced return to traditional capitalist values. It’s telling that his pre-race snack is a homemade PB&J rather than the decadent, elitist champagne of his evil corporate counterparts. The loss of the transcendental power of live action in Speed Racer’s visual approach is almost fitting, considering Speed’s politics, which view the film’s corporate environment as soulless and false. If anything, the film, like Speed, attempts to remind us that people are living, breathing things, even if their surroundings are slick, shiny, plastic and over-determined. But damn, those cars do look pretty cool, especially when they do flips. The mash-up of influences in "Speed Racer" is one of the factors that I feel positions it firmly within a post-modern avant-garde context, as many reviewers have pointed out. That patrick guy has posted the same comment on every blog post I've seen about Speed Racer. Weird. I loved your review. I adore the visuals in Speed Racer and have been very disappointed with the simplistic comments from a lot of critics. Yes, the movie is candy-colored, yes it's ridiculous, but it's also interesting and worth picking apart to see what makes it tick. That's incredibly amusing. What an insane thing to do.